The Third Runway Expansion project proposed by the Airport Authority is entering into a critical juncture, as the associated EIA report will be released this Friday (June 20th) for public inspection. On the very same day, a 30-day public consultation period will be launched by EPD according to the EIA process. As the second largest reclamation project ever in Hong Kong histor y, which will involve 650 hectares of reclamation within the Chinese white dolphin habitat, the serious impacts from this project will be far-reaching for the dolphins, and HKDCS has been studying these impacts in the past few years. Before the official release of the EIA report, HKDCS researchers have analyzed some of the long-term dolphin monitoring data, to shed light on several key issues that will be the focus of debate during the EIA public consultation period. Dr. Samuel Hung, Chairman of HKDCS, has been leading a long-term monitoring study on Chinese White Dolphins since the 1990s to track the lives of many individual dolphins in Hong Kong. Using their photo-identification records, his team revealed that there are two social clusters of dolphins (or two dolphin communities) inhabiting the North and West Lantau waters respectively. Although the members from the two social clusters do not interact with each other as much as within their own community, they occasionally meet up in areas where the ranges of two communities overlap. Moreover, recent research discovered that there are 65 members from the northern social cluster, and about 70% of them (i.e. 45 dolphins) frequently utilize the sea area where the third runway reclamation is proposed. More importantly, researchers found that the dolphins frequently utilize the proposed reclamation footprint as their major traveling corridor, in order to roam extensively between their two most important habitats in North Lantau waters, namely the BrothersIslands, and the Sha Chau and LungKwuChauMarinePark. Unfortunately, this traveling corridor for the dolphins has been increasingly obstructed, due to the frequent high-speed ferry traffic originating from the Sky Piers at the HK International Airport, as well as the recent reclamation works of the Boundary Crossing Facilities for HK-Zhuhai-MacauBridge. These obstructions have already led to a significant decline in dolphin usage at the BrothersIslands in Northeast Lantau waters. It is certain that if the proposed reclamation of the third runway goes ahead, this traveling corridor will be severely contracted, and effectively diminish the space which at least 55 dolphins have been using regularly to move between Northwest and Northeast Lantau waters. It is obvious that the proposed reclamation footprint of the third runway is situated at a very sensitive dolphin habitat. If given the green light, the members of the northern social cluster will face an enormous amount of pressure in North Lantau waters during the construction period, and in the worst case they may disappear from there due to this infrastructure project. 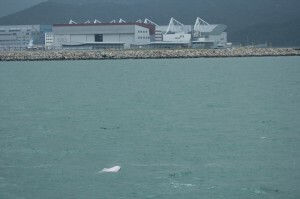 This will certainly go against the conservation goal of Chinese White Dolphins established by the HK government. (7) Airport Authority has proposed several mitigation measures or compensation measures so far, but they are either inappropriate or inadequate to address the serious threats as mentioned above. In this critical time, HKDCS will actively participate in the public inspection of the EIA report, and will use the 30-day public consultation period to launch a territory-wide campaign. The campaign – 30 Dolphin Victims – aims to involve the Hong Kong public in voicing their concerns for the dolphins, by submitting comments to EPD and ACE during the consultation period. The campaign is related to the 45 dolphins mentioned above, that have regularly utilized the third runway footprint until now. They will be the most direct victims of the project, as their home will destroyed due to the reclamation works. We all know that Chinese White Dolphins cannot oppose this project by raising their own concerns, and they cannot fight for their own right during the EIA process. They need the Hong Kong public to voice their concerns on their behalf, and bring their worries back to the EIA consultation process. For the campaign, we will pick 30 dolphin representatives, and give them the opportunity to express their views on the third runway through Facebook, websites and other different channels. They will sincerely urge the Hong Kong public to submit comments on the EIA report during the 30-day consultation period. HKDCS will also encourage some members of the public to take a leading role, and provide training to at least 100 “Dolphin Guardians”. These Dolphin Guardians will attempt to collect 10,000 comments from the Hong Kong community, to reflect the problems of the EIA report and grave concerns over the dolphin survival back to EPD and ACE members. These public comments will urge them to critically scrutinize the EIA report on the best interest of the dolphins.